An undated handout photo provided by the Greek Culture Ministry shows an prehistorical stone wall. 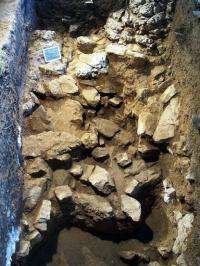 The ministry said Greek experts discovered the oldest stony wall of the country, blocking the entrance of a cavern for 23,000 years in Thessalia, in the north. The wall blocked two-thirds of the entrance to the cave, located close to Kalambaka, itself near the popular tourist area and monastic centre of Meteora in central Greece. Greek palaeontologists have been excavating the site for the last 25 years. they really dont know why it was built. Maybe they were holing up in a cave to keep warm but the wall might have been there to keep invaders or animals out. It appears to be less "built" than "piled". Maybe just the remnant of a slurry of rubble washed into the cave mouth during the Flood? I jest! The age of the our specie is determined circa 80000 years. This find has 23000 years. Over 57000 years, people could learn to build walls. People appear to have been making serious maritime voyages for twice this long. High-class art had hung on the walls of French caves, for 10,000 years when this wall was built. But most construction was of organic materials, and did not last. We probably get some wrong ideas, by placing too much weight on what we find in caves: they were never "representative" living-contexts.